Beyond sun-safe behaviors, skin cancer prevention also is accomplished with sunscreens, skin self-exams, and periodic surveillance of the skin. SPF stands for Sun Protection Factor, but it’s confusing, because “SPF” only rates a sunscreen’s protection against UVB radiation, the kind that causes sunburns and skin cancer. There’s another kind – UVA – and it’s important, too. UVA radiation also contributes to skin cancer and is the prime cause of sun damage, including wrinkles, leathery skin, age spots, loss of the underlying structure that gives firmness and support to the skin. It is important to choose a broad-spectrum sunscreen that protects against both UVA and UVB. Under new FDA rules, a sunscreen can be labeled “Broad Spectrum SPF” if FDA determines that it protects against both UVA and UVB rays. The number after “SPF” will tell you the degree of that protection. Sunscreens will no longer be labeled “waterproof, “sweatproof, or “sunblock. SPF levels may be capped at 50. Instead of trying to figure out sunscreen labeling rules, though, you can simply look at the INGREDIENTS. Remember: 3 ingredients – ZAT! 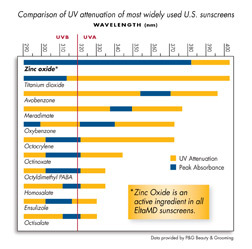 Zinc provides the broadest spectrum protection of all sunscreen ingredients. It is a physical sunscreen, in that its mineral content actually comes between your skin and the sun. Good zinc-based sunscreens may be hard to find at discount stores or drug stores. At Dermatology Specialists of St. Louis, top quality zinc-based sunscreens are now available with transparent zinc. We recommend a line of transparent zinc-based products with the brand name eltaMD. It is sold through physician offices. We have tested it over a period of years, and we feel it’s a first-rate product. We also sell it in the office. Apply eltaMD sunscreen thoroughly and smoothly, so that you can see that coverage is complete. Then, over 2 to 10 minutes, as the sunscreen warms against the skin, it becomes transparent, light, and non-greasy. 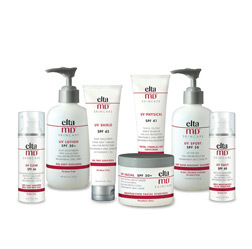 EltaMD sunscreens are ideal for daily use, under make-up or alone, especially on the face and ears. More information about eltaMD is available at the company website www.eltamd.com. Avobenzone is a chemical sunscreen agent with an absorption peak in the UVA spectrum. That means it’s a UVA radiation-absorber. Initially, the use of avobenzone was limited, because it decomposed quickly in UV light – troubling for a sunscreen. Adjusting the chemical formulation has improved its stability. That’s why you’ll see Octocrylene with it on the ingredients list on the back of your sunscreen. Avobenzone is used in many clear sunscreens and sprays. Aerosol sunscreen sprays featuring avobenzone are available at some stores that sell sunscreen, and they’re a good choice for use on the body. Titanium dioxide, like zinc, is a physical sunscreen agent and protects the skin well against both sunburn and sun damage. It occasionally appears in sunscreens with zinc, in fact. The chief limitation of sunscreens that feature titanium dioxide is that they have a tendency to discolor white fabrics and give them a yellow-ish tinge that will not wash away easily in the laundry cycle. 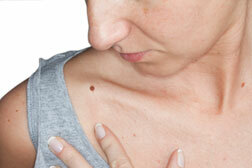 Suspicious skin growths – i.e., lesions, moles, or other abnormalities—may need further evaluation. Spot checks with a dermatologist on a yearly basis may be a wise choice. This is especially true for those with many moles, history of pre-cancer or skin cancer, family history of certain malignancies, or new or changing spots. Spot checks may be directed toward a single lesion, or can include a complete skin exam. Periodic surveillance of the entire skin helps to detect lesions that otherwise may go unnoticed.